Your Parsippany Dentist Says Sugar Free Gum Is Good! It’s September, and you know what that means! Oh — you didn’t know this September 30 is National Chewing Gum Day? Your dentist in Parsippany wants to spread the word that popping a piece of sugar-free gum in your mouth after and between meals is a great idea for your oral health! 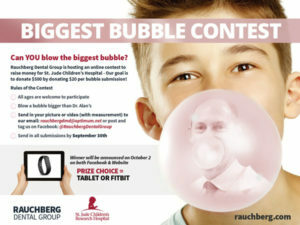 To honor the “holiday,” we are excited to be holding a Biggest Bubble Contest online through September. We’ll donate $20 to St. Jude’s Children’s Hospital for every submission received. We hope to donate $500 in total! How can you enter? Just upload a photo of yourself blowing a piece of gum — make sure it’s sugar free for healthy teeth! — and include the bubble’s measurement with your entry. Blow a bubble bigger than Dr. Alan’s to win your choice of a tablet or a Fitbit! Winners will be announced through Facebook and on our website on October 1, so don’t forget to check back after you enter the contest to find out if your bubble tops the best! Chewing sugarless gum does more than just freshen your breath (though we all love that about it after lunch). It’s actually a real benefit for your oral health, too. We’ve listed the top benefits of sugar-free gum below! **Remember that chewing gum containing sugar may give you some of the benefits, but the sugar will eventually weaken the enamel and leave you more vulnerable to cavities. Sugarless is always best! Having plenty of saliva in your mouth is important for keeping your teeth and gums clean and your breath fresh. Depending on how healthy you are and what medications you take, your mouth may naturally produce less saliva than it needs to stay clean. Sugar-free gum can help encourage saliva flow to wash away the acids and bacteria that cause tooth decay and gum disease. Chewing gum after meals also keeps food particles from building up between teeth — especially helpful if you don’t have time to brush after meals throughout the day. When you have plenty of saliva, your tooth enamel is also stronger thanks to the calcium and phosphate that are naturally present in spit. And research shows that chewing gum can actually help to remineralize the tooth enamel while also neutralizing the acids and bacteria that weaken it when they’re left in the mouth too long. If you’re busy searching for a “dentist near me,” you’ve found us at Rauchberg Dental Group. Our team is made up of experts who are passionate in their field. We’ve been providing superior dental care for families and individuals for years — and we invite you to contact us at (973) 334-3777 to schedule an appointment for excellence in preventive, cosmetic, or restorative dental care today. Comments Off on Your Parsippany Dentist Says Sugar Free Gum Is Good!